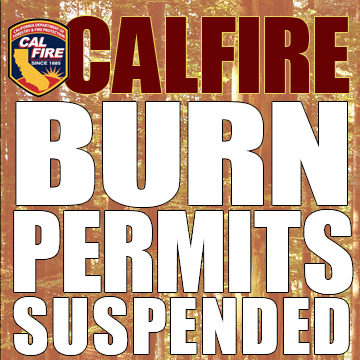 Dry conditions, and a lack of firefighting resources available in our area, have prompted officials for CalFire to suspend burning permits throughout the Lassen-Modoc Unit. This suspension takes effect at midnight tonight and prohibits all residential outdoor burning of landscape debris such as branches and leaves until the suspension is formally rescinded. To keep informed about burn permits and other important fire information, please like us on Facebook, follow us on Twitter, or signup at Constant Contact to receive emails. Want to receive information whenever wildfire breaks out? Simply follow this link and sign up for the CalFire Lassen-Modoc alert notification system. It’s easy and you will get instant information whenever there is an emergency in our area.